Married Name Her married name was Tilton. Ida Sophie Louise Ahrens married George Earl Tilton. Ida Sophie Louise Ahrens was born on 7 June 1891 at Beecher, Will, Illinois. She was the daughter of William Ahrens and Maria (?). Ida Sophie Louise Ahrens died on 13 September 1956 at age 65 Ida (Ahrens) Tilton obituary. She was buried after 13 September 1956 at Washington Memory Gardens, Homewood, Cook, Illinois. George Earl Tilton married Ida Sophie Louise Ahrens, daughter of William Ahrens and Maria (?). George Earl Tilton died after 1956. 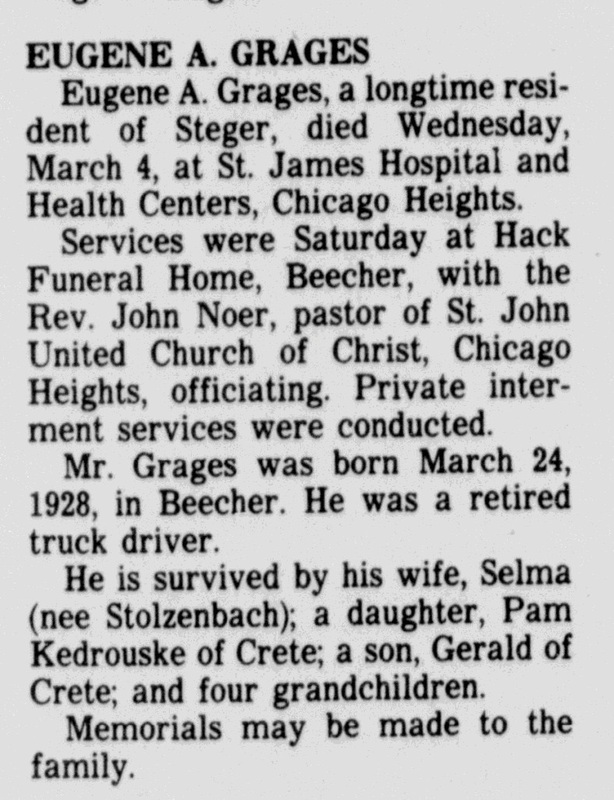 Eugene Alfred Grages was born on 24 March 1928 at Cook, Illinois. He was the son of Aldin J. Alcumbrac and Maria Sophie Catherine Caroline Grages. Eugene Alfred Grages married Selma June Stolzenbach, daughter of Carl Stolzenbach and Alvina Louise Nottorf, before 1953. 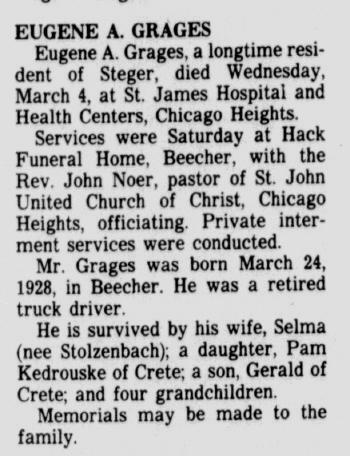 Eugene Alfred Grages died on 4 March 1992 at Cook, Illinois, at age 63 Eugene Alfred Grages obituary. Married Name 14 June 1923 As of 14 June 1923,her married name was Stolzenbach. Alvina Louise Nottorf was born on 19 February 1896 at Minnesota. She married Carl Stolzenbach, son of Eckhardt Stolzenbach and Caroline Shuette, on 14 June 1923 at Illinois. Alvina Louise Nottorf died on 20 August 1939 at Cook, Illinois, at age 43. Married Name before 1953 As of before 1953,her married name was Grages. Selma June Stolzenbach was born on 10 June 1931 at Illinois. She was the daughter of Carl Stolzenbach and Alvina Louise Nottorf. Selma June Stolzenbach married Eugene Alfred Grages, son of Aldin J. Alcumbrac and Maria Sophie Catherine Caroline Grages, before 1953. Selma June Stolzenbach died on 2 November 2008 at Cook, Illinois, at age 77 Selma June Grages nee Stolzenbach age 77, of Steger, IL, passed away November 2, 2008. Beloved wife of the late Eugene Grages, loving mother of Pamela (Jim) Kedrouske of University Park, IL. and Gerald (Marie) Grages of Crete, IL. Cherished grandmother of David, James, Roseanne, Carl and Peter. Dear sister of Alvina Williams, Leota Paquette, Verna Bauch and the late Melvin Stolzenbach. Dear aunt to many nieces and nephews. Visitation Tuesday November 4, 2008 from 3:00 p.m. - 8:00 p.m. at Smits Funeral Home-Steger Memorial Chapel (3045 Chicago Rd. Steger, IL.) Funeral Service Wednesday 10:00 a.m. at Steger Memorial Chapel. Interment at St. Pauls Cemetery, Beecher, IL. She was buried after 2 November 2008 at Saint Paulus Cemetery, Beecher, Will, Illinois. Name Variation Aldin J. Alcumbrac was also known as Aldin M.
Aldin J. Alcumbrac was born on 1 January 1893. He married Maria Sophie Catherine Caroline Grages, daughter of Friedrich Heinrich August Grages and Sophia Maria Catharina Louise Anna Fiene, in January 1928 at Indiana marriage license obtained 7 Jan 1928. Aldin J. Alcumbrac and Maria Sophie Catherine Caroline Grages were divorced before 1943. Aldin J. Alcumbrac died on 29 May 1961 at age 68. He was buried after 29 May 1961 at Plainfield Township Cemetery, Plainfield, Will, Illinois. Margaret Erickson was the daughter of (?) Erickson. Margaret Erickson was buried in May 1948 at Illinois Mr and Mrs Walter Klemme and daughter Joan, Mrs Leslie Adams, Mrs Dee M Sumpter, Mrs Gus Janetske and Mrs A C Hartmann attended funeral services for Margaret Erickson at the West End funeral chapel, Chicago Heights, last Wednesday afternoon. Miss Erickson, who died suddenly May 9 at her home in Chicago was a sister of Mrs Klemme and was a former resident of Chicago Heights. She died in May 1948 at Chicago, Cook, Illinois. William Duensing married Joan Jean Klemme, daughter of Walter William Klemme and Helen Evangeline Erickson. Eugene Hill married Lois June Schoenwald, daughter of William Ferdinand Schoenwald and Alice Leona Heldt. John Parker married Evelyn Schoenwald, daughter of William Ferdinand Schoenwald and Alice Leona Heldt. Alfred Heldt married Daisy Jaycox on 20 September 1911. Alfred Heldt died in 1915. Leslie Heldt was the son of Alfred Heldt and Daisy Jaycox. Charles H. King was born circa 1908. He married Lillian Bremer, daughter of Friedrich Heinrich Bremer and Bertha Klemme, on 5 November 1953 at Lucas, Ohio. Bernard Leon McHale was born on 22 December 1922 at Brunsville, Plymouth, Iowa. He was the son of Jesse O. McHale and Kathryn E. Rieken. Bernard Leon McHale died in August 1947 at Brunsville, Plymouth, Iowa, at age 24 Bernard Leon McHale obituary. Gaylord Hopkins married Marjorie McHale, daughter of Jesse O. McHale and Kathryn E. Rieken, on 18 September 1971. (?) Kallsen married Minnie Tapper, daughter of Benjamin Tapper and Anna P. Weers. Allen Dennis Rohlfs was born on 6 September 1942 at LeMars, Plymouth, Iowa. He married Janice Gay Klemme, daughter of Walter Albert August Klemme and Clara Heeren, on 14 May 1967. Allen Dennis Rohlfs died on 9 February 2015 at LeMars, Plymouth, Iowa, at age 72 Allen D. Rohlfs, 72, of Le Mars, Iowa passed away Monday, February 9, 2015 at The Abbey of Le Mars. Visitation will be after 5:00 p.m. Friday, February 13, 2015 at the Carlsen Funeral Home in Le Mars with a 6:00 p.m. Prayer Service Friday evening at the funeral home with military honors provided by the Wasmer American Legion Post #241 of Le Mars. Inurnment will be at the Black Hills National Cemetery in Sturgis, South Dakota. Expressions of sympathy can be extended to the family through www.carlsenfuneralhome.com. Allen Dennis Rohlfs was born September 6, 1942 in Le Mars, Iowa to Alvin and Lila (Kenowith) Rohlfs. Allen was raised on a farm and attended school at the Chatsworth Independent School and graduated from Hawarden High School in 1960. He enlisted in the United States Air Force in 1961 during the Vietnam War. He was stationed at Lackland Air Force Base in San Antonio, Texas. He was later assigned to Shepherd Air Force Base in Wichita Falls, Texas where he attended Computer Tech School. He was then assigned to Ellsworth Air Force Base in the Black Hills of South Dakota for 3 ½ years before being Honorably Discharged in 1965. Allen was united in marriage to Janice Klemme on May 14, 1967 at Immanuel Lutheran Church in Akron. Allen and Janice had lived in Omaha, Nebraska; where Allen worked for Woodmen Insurance as a computer system operator for over 30 years. They had also lived in Council Bluffs, Iowa before retiring in 1997 and returning back to a farm in Plymouth County. Janice passed away on May 15, 2010. Allen enjoyed traveling, listening to country music, dancing, and attending county fairs. Allen also had a gift for being organized, he was a very detailed individual and enjoyed doing his bookkeeping. Survivors include a son, LaMont Rohlfs of Akron; his mother, Lila Rohlfs of Le Mars; a brother, Ronald Rohlfs and his wife Susan of Omaha, Nebraska; a special friend, Sharon Lee Baker of Oakland, CA; a favorite aunt, Helen Kenowith of Le Mars; one niece and five nephews; and several great nieces and nephews. He was preceded in death by his father Alvin Rohlfs; his wife Janice and his brother Marlin. Married Name Her married name was Baack. Katherine Plueger married Carl Baack. Katherine Plueger died after 1962. Carl Baack married Katherine Plueger. Carl Baack died before 1962. Fred Zornow was the son of (?) Zornow. In June 1912 at Plymouth, Iowa, Edwin and Anna (Bubs) Klemme enjoyed a visit from her parents, Albert and Minnie (Zornow) Bubs of Spink, South Dakota, and her uncle Fred Zornow with his son Raymond from Cleveland, Ohio. Raymond Zornow was born before 1912. He was the son of Fred Zornow. Married Name circa 1926 As of circa 1926,her married name was Stolzenbach. Emma Segert was born circa 1900 at Indiana. She married George Stolzenbach, son of Eckhardt Stolzenbach and Caroline Shuette, circa 1926. Wilhelm Segert was born on 2 September 1845 at Germany. He married Anna Buehre, daughter of Johann Otto Buehre and Wilhelmina Maria Oldendorf, in June 1875. Wilhelm Segert died on 30 May 1929 at Indiana at age 83. Married Name 18 September 1915 As of 18 September 1915,her married name was Lemcke. Caroline Segert was born on 2 June 1884 at Lake, Indiana. She was the daughter of Wilhelm Segert and Anna Buehre. Caroline Segert married John C. Lemcke on 18 September 1915. Caroline Segert died on 21 April 1932 at Akron, Plymouth, Iowa, at age 47. 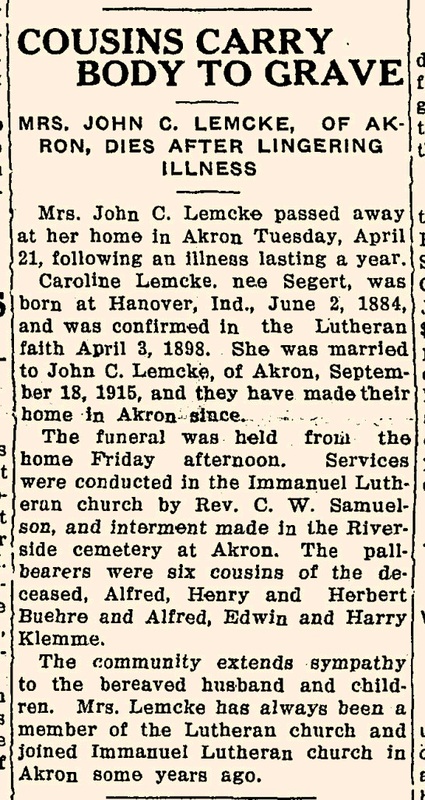 She was buried after 21 April 1932 at Akron, Plymouth, Iowa, Mrs John C Lemcke (Caroline Segert) funeral notice. John C. Lemcke married Caroline Segert, daughter of Wilhelm Segert and Anna Buehre, on 18 September 1915. John C. Lemcke died after 1932. 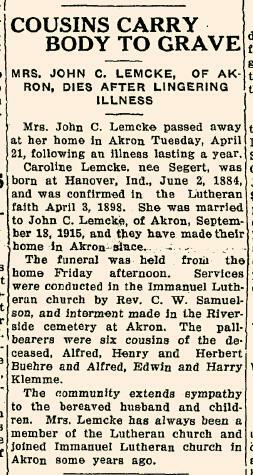 He witnessed the burial of Caroline Segert after 21 April 1932 at Akron, Plymouth, Iowa; Mrs John C Lemcke (Caroline Segert) funeral notice. (?) Drotar married Elizabeth Vermette, daughter of Bob Vermette and Viola Boehner.